The year is 1630. The capital of Japan is still under its original name, Edo, and though samurais still exist, the shogunate has severely lessened their power. An older, bearded swordsman appears at the gate to the estate of Lord Iyi, a still thriving patriarch. Having lost his own master, this samurai has been a ronin for many years. 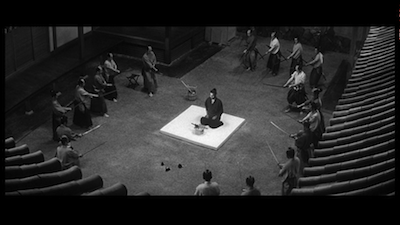 Tired of eking out a living and only finding starvation for his efforts, he requests that Iyi's men let him use the spacious courtyard of their compound as a place to commit ritual suicide, formally known as "seppuku" but also called "harakiri." 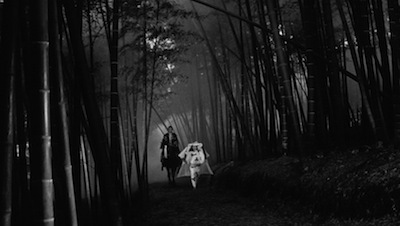 Indeed, the original title of Masaki Kobayashi's 1962 film was Seppuku in Japan, but it was likely changed to Harakiri for international release as that is the more commonly known term worldwide. Respected Japanese actor Tatsuya Nakadai stars as Hanshiro Tsugumo, the swordsman at the end of his tether looking for an honorable death. Rentaro Mikuni is Counselor Saito, the man charged with managing the daily goings-on at the Iyi manor. Saito is suspicious of Tsugumo's motives, as it has become commonplace for ronin to show up at rich homes claiming to be seeking a place to die but really looking to extort money from a well-to-do family who doesn't want the public disgrace of a dead warrior in their front yard. This scam began honestly, when one of the many samurai left in the cold by shogunate reform legitimately sought a nice place to spend his last breath. The clan he went to was so impressed by his sincerity, that they gave him a job; those who followed this have been con artists. In fact, Tsugumo is not the first to come to the Iyi manner seeking this kind of asylum. Several months before, a younger man named Chijiwa (Akira Ishihama) arrived under similar circumstances. 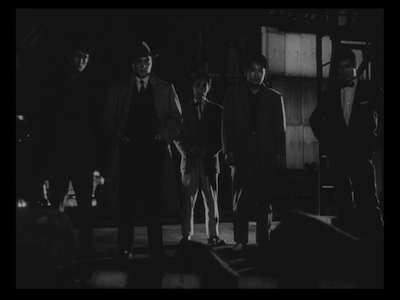 Saito and his men doubted his intentions, too, but ultimately, they made him carry out his promise. 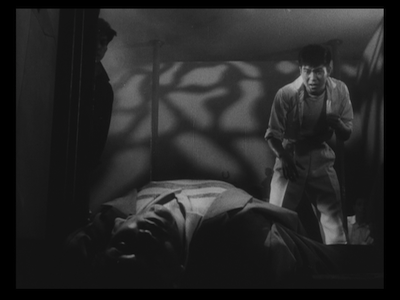 Chijiwa's tortuous death is the grisliest scenes in the movie, and Saito's detailed explanation of the disembowelment--which we see as an actual flashback--is meant to dissuade Tsugumo from pushing the matter further. The audience may be unsettled by the painful self-immolation (I certainly was), but Tsugumo is not. He insists on going ahead, his desire to die is very real. Harakiri's twist, however, is that despite his true intentions, Tsugumo has not revealed his full motivation. The former warrior was a father and a grandfather who watched his family's livelihood dwindle as he clung to an unyielding code of honor--one he has decided that others higher up the food chain have not been as dedicated to. His narrative is more entangled in recent events at the Iyi manor than was originally apparent. The reality of what is happening grows more knotted and tragic the deeper Tsugumo draws us in. 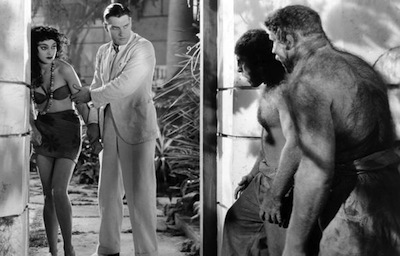 The movie may be black-and-white, but its often-grotesque tapestry is anything but. The hubris of the Iyi clan is they demanded simplicity because it was easier for them to deal with, even though life is far more complex. Tatsuya Nakadai is astounding in the lead role. He plays present-day Tsugumo as a man who is staunchly resolute. He quietly commands the room, wresting control from Saito in ways both bold and manipulative. When insisting that the counselor and his retainers continue listening to his story doesn't work, he has other gambits waiting to be played. In the flashbacks, the actor is afforded the opportunity to show his range. Tsugumo's life swings from happiness to heartache, and the unraveling of his confidence is devastating to behold. 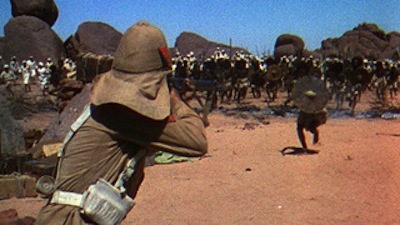 The performer shows just as much strength in the battle scenes, finding a balance between an old warrior's confidence and his somewhat faulty muscle memory. He is not as strong or as agile as he once was, and Nakadai is careful to show, through gesture and expression, that it's righteous passion that allows this samurai to not just hold his own, but to best his opponents. 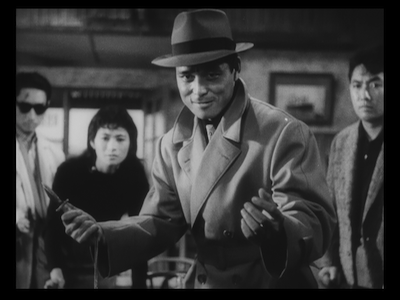 Fans of Japanese cinema likely know Nakadai from his work with Akira Kurosawa, including High and Low [review], where he proved himself more than an able co-star next to the great Toshiro Mifune, but also later in life as the unhinged father in Ran [review]. It's an impressive career even before you factor in his previous collaboration with Masaki Kobayashi, the towering epic The Human Condition [review]. Comparing that multi-part drama with this one is a bit like comparing apples and oranges, but they both stand tall as portrayals of individuals pushed as far as they can be pushed. It's a dramatic situation both timeless and timely: when the system fails to protect the people it was created to serve, when those at the upper levels of power forget about individuals that form the basis for their rule, those desperate for justice will find a way to get their due. Not that any victory is clean. 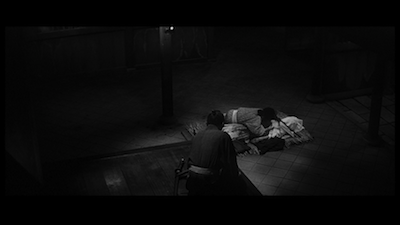 Following a harrowing, tension-filled climax, Harakiri has a bitter denouement. The cynical message: if you're going to strike at a snake, you'd best take out the head, or its venom will still have an outlet to poison the world further. Kobayashi works here from a script by Shinobu Hashimoto. The film is tightly constructed on two different timelines, and the writer makes smart decisions of when to click back and forth between past and present. 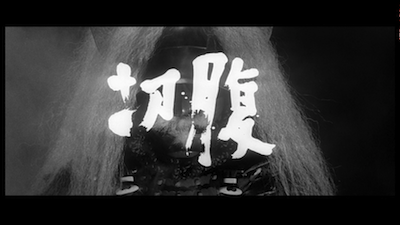 In some ways, Harakiri is like a mystery. We know, in essence, who killed Chijiwa, but the metaphorical culprit, the source of the misery that led him to the murder scene, still needs to be uncovered. 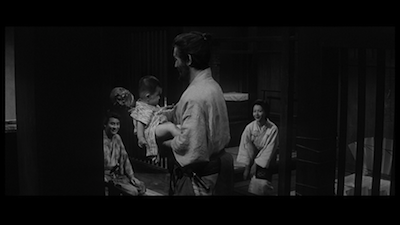 Cinematographer Yoshio Miyajima works in the tight hallways of the palace and even the tighter quarters of Tsugumo's impoverished hovel, to choreograph the narrative and emphasize just how trapped the ronin really is. The courtyard where the suicides take place boxes the victims in, and yet the estate that surrounds them is like a maze. On his climactic dash through the Iyi home, Tsugumo breaks through different walls, each one revealing another layer of the internal bureaucracy. As a metaphor for the lone citizen taking on the system, it's incredibly powerful. 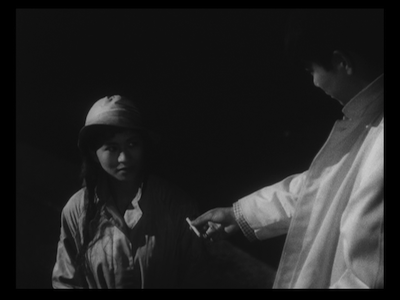 What Tsugumo finds there is ultimately hollow, and thus Harakiri is all the more unnerving. If you don't walk away from this movie shaken all the way down to your shoes, I'm not sure you were really watching what was going on. 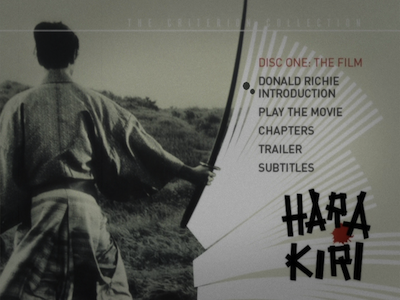 Criterion first released Harakiri back in 2005 as a two-disc DVD set. As the screengrabs here show, the restoration done back then was impressive enough already, but the high-def Blu-Ray transfer is a thing of beauty. The black-and-white photography is sharper than ever before, with rich, deep detail and incredible textures. Close-ups on the actors in tense moments reveal so much about the pain and fear the characters are suffering just by letting us see the sweat on their brow and the tears in their eyes so vividly. 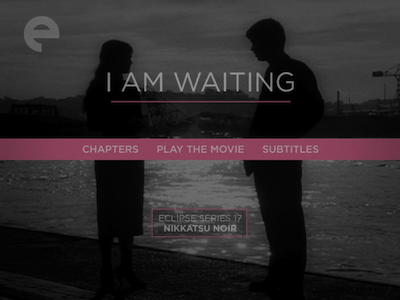 The new edition also keeps all the extras from the previous set, including an interview between Masaki Kobayashi and Double Suicide-director Masahiro Shinoda (that makes for a fitting duo, if not a depressing double feature). There are also more recent interviews with Nakadai and Hashimoto and a pretty cool poster gallery. 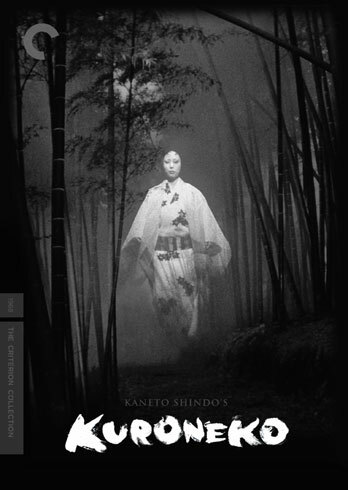 There is a 3D remake of Harakiri on the way, helmed by irascible Japanese madman Takashi Miike. It will be interesting to see how Miike handles the material. I'd have thought him a pretty poor choice for Harakiri--and really, would have been against remaking what is essentially a perfect film--before seeing his masterful redo of the samurai showdown picture 13 Assassins [review]. The concept of ritual suicide certainly has the potential for different avenues of exploration. 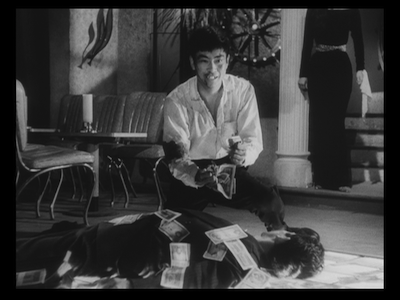 Let's not forget that just three years after Kobayashi stormed Cannes with Harakiri, bad-boy author Yukio Mishima unleashed his short film Patriotism [review], a film that is just as vivid in its gruesome details but with a decidedly different point of view. 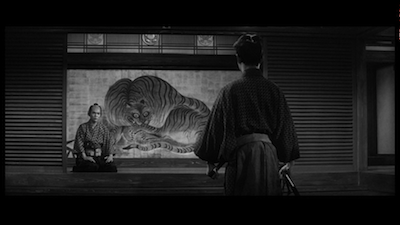 Whereas Kobayashi decides that seppuku is an empty gesture given foolishly in deference to an uncaring power structure, Mishima considers it the ultimate expression of fealty to something greater than yourself (for him, Japan). 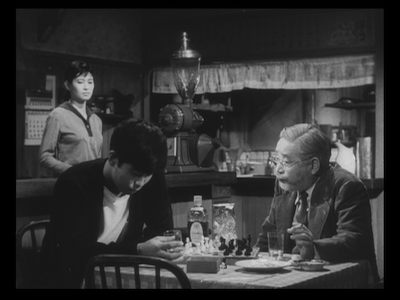 Both films are effective, though ultimately, Kobayashi's is more fulfilling and easily more persuasive. Please Note: The screen captures used here are from the standard-definition DVD released in 2000, not from the Blu-ray edition under review. There is a scene in the last act of Jean Vigo's 1934 film L'Atalante where the old sailor Père Jules, played by legendary French actor Michel Simon, imagines he is playing a record by moving his fingers along the groove. 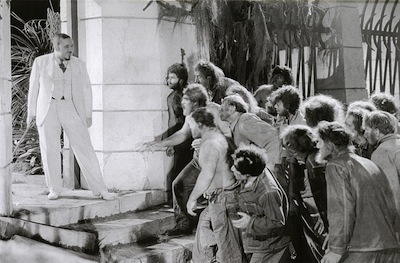 Vigo lays in accordion music to match his movements, stopping and starting as he does, before pulling back to reveal that Jules has been tricked by his young bunkmate (Louis Lefebvre). The boy has been playing the accordion just out of frame. Angered by the prank, Jules admonishes the kid, telling him that he might laugh at such a flight of fancy, but is playing a record with your finger all that impossible? They don't understand how electricity works, or how music is sent across radio waves, so how can they rule anything out? 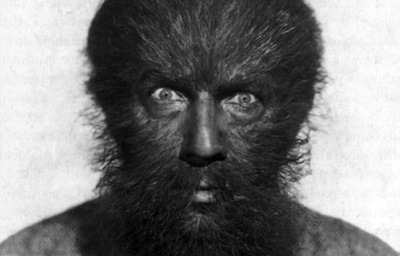 L'Atalante has a similar allure. 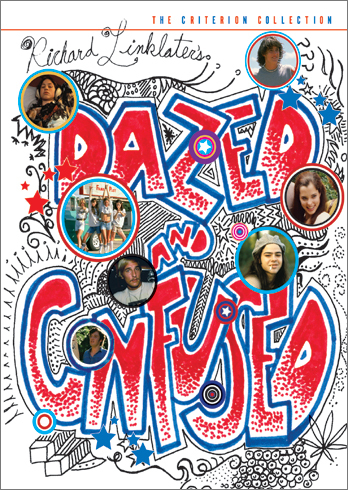 It may not be obvious why this unassuming little film works so well, but it somehow enchants all the same. Perhaps it's Vigo's creation of this dual universe, of a world where dreams can sit side by side with hard reality, that is the secret to its success. We want to be enthralled under its spell, because maybe then we can believe that our own reality is worth it. The story opens in a small town in rural France. A wedding ceremony has just concluded, joining local girl Juliette (the luminous Dita Parlo) with a boat captain named Jean (Jean Dasté). Jean is the skipper on a three-man barge that sails the French canals, delivering goods from port to port. Juliette has never left her birthplace prior to this honeymoon, and yet her married life is immediately on the move. More than that, the barge will be her conjugal home, always in motion, the background forever changing. It's going to be quite an adjustment for her. Indeed, it's going to be an adjustment for the whole crew. Yet, Juliette has always known that the water holds her fate: she believes if you stick your head below the surface, you will see the image of your true beloved. It's how she knew who Jean was before she even met him. So, Juliette dreams of love, and she also dreams of seeing Paris. 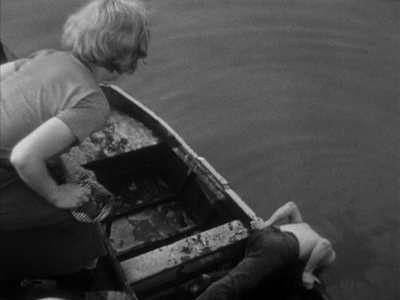 Eventually, the boat--which, like the movie, is named L'Atalante--will get her there. Strife amongst the workforce prevents her from enjoying it when they do, just one of the many disappointments the new bride will suffer. At the same time, she makes peace with Père Jules, who invites her into his cabin. There, the salty dog shows her the bizarre treasures he's gathered from around the world. Having never seen such wonders, Juliette is mesmerized. Some of the objects are simple, like a Chinese fan, others are more unique, like the jar holding the hands of Jules' best friend, now deceased. We will see this joy at such unexplainable sights two more times before L'Atalante is through: next at the port where Juliette meets a salesman (Gilles Margaritis) that is an expert at sleight-of-hand, and then the last time when Juliette finally sneaks off to Paris. Each time, this happiness will be balanced by darkness. When Jean finds Juliette in the cabin of his second-in-command, he loses his temper. Enflamed by jealousy, he reveals a previously unseen violent streak. It shows up again when they meet the salesman, and also when he discovers Juliette has disappeared. Only that final time, he abandons Juliette to the city...and himself to despair. 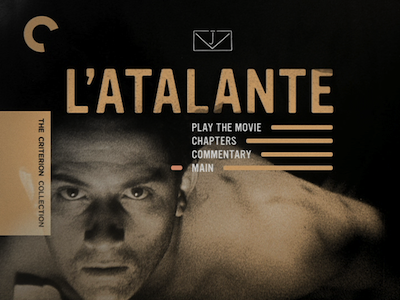 L'Atalante is a deceptively simple romance. The basic story may lack complication, but the presentation has many layers and a balanced sense of its internal world. There are dualities throughout, be it above deck and below deck, sea and land, town and city. Both Jules and Jean have double natures, and both are capable of tenderness and violence alike--though, despite his warnings that he might strike, Jules never does, whereas Jean hides his anger until it's too late. This makes sense, though, when you notice that Jules has an ability to appreciate life's magic that Jean does not possess. Jules has been to all corners of the globe and seen many things, whereas it's possible Jean has only sailed up and down the same canals. When Juliette compels him to look into the water to test his love, he sees nothing, and his pretense otherwise doesn't fool her. It's a very romantic trope, actually. Jean has to learn to see the world in the same way as his wife if he ever hopes to keep her. Juliette is too innocent for the common world, and she could be tempted away if not careful. To protect her properly, he has to be able to match the purity of her feeling toward him. It's the only way he will ever be worthy. 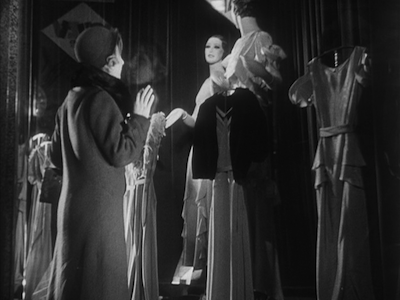 In his earlier short films [reviewed here], Jean Vigo experimented with camera effects and used a lot of tricks to create a feeling of wonder that he manages effortlessly without them in L'Atalante, his only full-length feature. 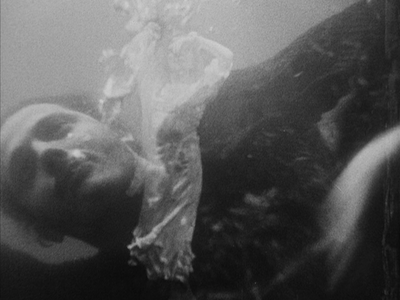 The only visual technique he revisits is the underwater photography he showed in 1931's Taris, his portrait of a champion swimmer. His camera will have to go below surface once again to capture Jean's transformative moment, as the skipper literally must go deep in order to rise again as a new man. 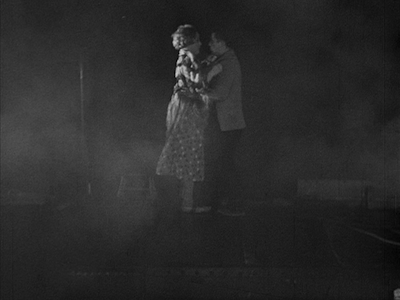 There are few other effects in L'Atalante; at the same time, Vigo creates a dynamic spatial relationship between his actors and his camera. In one memorable shot, Jean crawls across the deck of the barge, just like one of Père Jules' many cats, creeping up to the camera lens and then climbing over. There are many shots like this, where the director is so deep in the thick of things, it's almost as if the characters know he is there. The salesman, for instance, practically performs directly to the screen. This allows for intimate observances, be it Juliette's private fantasies while window shopping in Paris or our glimpse into their separate bedchambers when the newlyweds have rapturous dreams about one another, the fires of loneliness and desire stoked by their time apart. 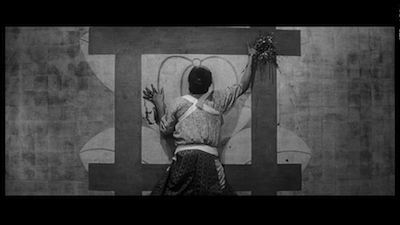 It's finding these lyrical moments within the dirty confines of the everyday that sets Jean Vigo's work apart from his contemporaries, inspiring many filmmakers who came after. It's also a defining element in Simon's performance style, his combination of a very complete physical presence with a clownish demeanor. 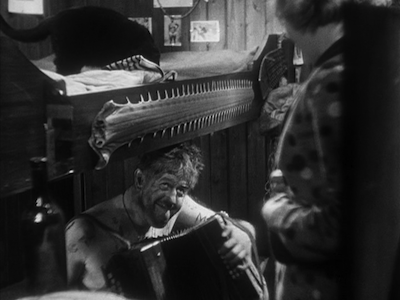 He's just as amazing in L'Atalante as he was in Jean Renoir's Boudou Saved From Drowning only a couple of years earlier, or as he would remain in The Two of Us [review] decades later. Jean Vigo, on the other hand, never made another film after L'Atalante. 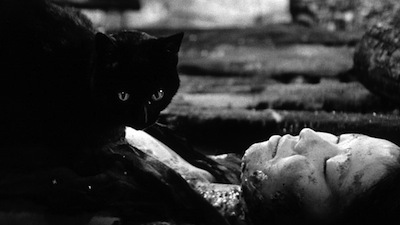 He died of sepsis just after L'Atalante was completed. Given the assured aesthetics of this debut, we can only speculate where he might have gone from here. Maybe even greater things, maybe he would have peaked just as he began. We can never know, we are only left with this one perfect vision, a dream that holds strong even in the here and now of the 21st Century. The man who would be codenamed Carlos, and nicknamed "The Jackal," was a Venezuelan-born son of Communists who, at the age of 21, joined the Popular Front for the Liberation of Palestine and became one of their most brutal enforcers. 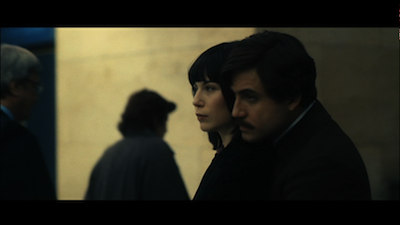 The 2010 biographical film Carlos by French director Olivier Assayas explores his life from his joining the PFLP in the early 1970s through his arrest by the French government in 1994. 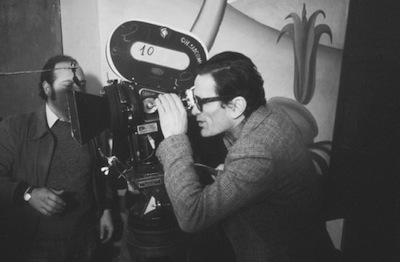 With a five-hour-plus running time, it is a filmmaking marathon. 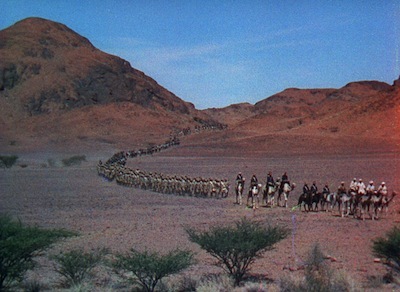 Its origin was on French TV, but it showed in North America as a multi-part special event screening at various theaters and was available on demand to cable TV subscribers before its eventual Criterion release. 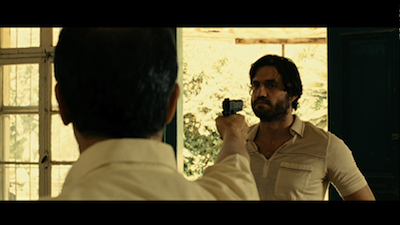 Édgar Ramírez, previously seen as a CIA agent in The Bourne Identity and a revolutionary in Steven Soderbergh's Che [review], stars as Ilich Ramírez Sánchez, the ambitious young idealist who took the name Carlos as his wartime handle, fighting for the liberation of Palestine and the destruction of capitalist imperialism. As portrayed here, Carlos is impatient for action, ready to make a name for himself and strike a blow in the name of the almighty cause. He distinguishes himself as a dangerous man after an impulsive shooting of several French police officers. His fame as an international menace is then solidified when he leads a raid on an OPEC meeting in Austria, taking diplomats from around the world hostage. The mission doesn't go entirely as planned, and this has good and bad consequences. The head of the PFLP disowns him, but this frees Carlos to form his own group and start giving the orders himself. Assayas, whose films are as diverse as the quiet family drama Summer Hours [review] and the clumsy actioner Boarding Gate [review], co-wrote the script for Carlos with television writer Dan Franck. 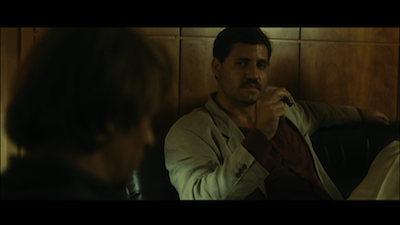 Each segment of Carlos begins with a disclaimer that the film has taken a fictional approach to the story, as much of what Carlos the Jackal really did is not entirely known. Certain connections have to be made for the sake of narrative structure. 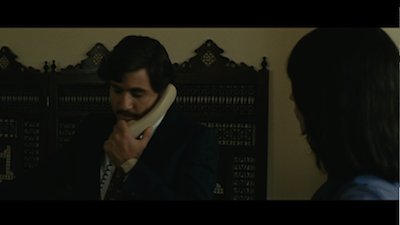 In terms of storytelling, the movie has a dry, historical approach, putting it in league with Che and The Baader Meinhof Complex [review], as well as, to a degree, the two Mesrine films [review part 1, review part 2]. This kind of docudrama seems to be an emerging genre, adopting a dispassionate approach that is almost apolitical in its just-the-facts approach. We are given very little background information on Carlos, and his mission is more of an abstract concept, there is no statement of intent. As the movie wears on, this seems to be part of Assayas' point: as he is unmoored from his idealistic safety zone, Carlos' activities seem to be less and less about the "struggle," and more about just maintaining his underground lifestyle. Alliances shift, and there really is no endgame. Whoever is on top is on top, and tomorrow it will be someone else. This technique works for most of the movie. Assayas adopts the look and rhythm of the best 1970s American films, which is fitting given the period nature of the piece. The convoluted structure of the story is also akin to tangled espionage dramas that emerged as a result of the Cold War, with secret agents so deep in the field, they tend to forget what mission put them out there in the first place. Édgar Ramírez is good as Carlos, though he is missing a certain charisma that might make the terrorist more of a romantic figure, the way Benicio Del Toro gave a little extra something to Che Guevara just by virtue of his being Benicio Del Toro. Ramírez lacks the same commanding presence. Still, he brings a compelling complexity to the character. Carlos believed he had a death sentence hanging over his head, and he used it as an excuse to drink and chase skirts. You also have to admire the actor's commitment. He lets his appearance go to match his subject's weight gain over the years. This all may be a canny move by Assayas. Carlos is essentially a gangster picture, the story of a murderer who lives the life and damns the consequences, but at the same time, subverts the genre by never letting the Jackal be the seductive dog others might choose to portray. 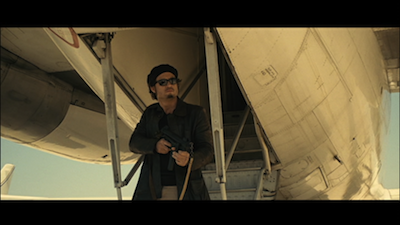 Other characters go in and out of the story, including European operatives and various Arab allies. We see different plots carried out by Carlos and his men, most of which fail in some way or another. 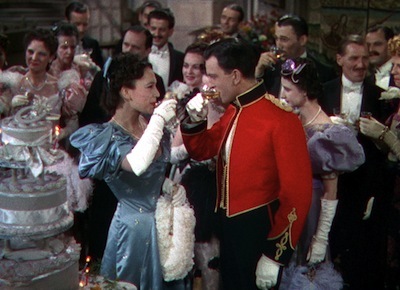 We also see him flounder at relationships, including a marriage to one of his own "soldiers" (Nora von Waldstätten). There is always a question of whether Carlos takes his threat level more serious than the rest of the world, if he exaggerates how much of a wanted man he really is; but then, his eventual takedown somewhat vindicates him. 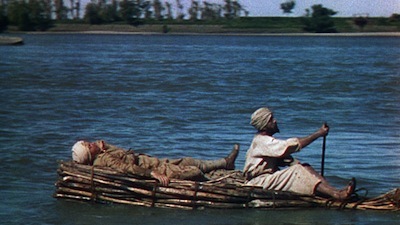 Carlos is really only cast adrift when Carlos himself is. 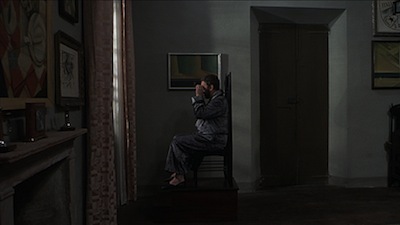 The final hour or so of the film, following the toppling of the Berlin Wall and the end of the Cold War, starts to drag. Frankly, it's because Carlos is not that interesting by this point. He has settled into the kind of bourgeois domestic lifestyle he otherwise decried. He even starts driving a Mercedes. Carlos drifts aimlessly from one country to the next, going to whomever will offer him political asylum. If in the first part of the film he is a decisive man of action, and in the second a delusional hothead, by the third he is not much at all. He teaches classes in guerilla theory in the Sudan, and postpones surgery for a swollen testicle to get liposuction on his love handles. In retrospect, he should probably be thankful to the French secret service for taking the time to come after him, because he's got nothing going on. In terms of the film's arc, Assayas should have sent them in 20 or 30 minutes sooner. It's almost like a backwards horror movie: instead of the boring bits lulling us into a place where we can be scared, Assayas shocks us first, and thus makes the boredom that follows all the more uncomfortable. Even with that complaint, Carlos still stands as a brash triumph. One has to wonder if this kind of long-form filmmaking, if Che and Mesrine and Carlos, is cinema's reaction to the continued growth of cable television and all the can't-miss series from the past several years. Audiences are becoming more and more prepared to invest several hours in one storyline, and if they are willing to wait from week to week or devour them in one massive go on DVD, then maybe they'd be willing to sit in a theatre for six hours, too. It's an experience akin to spending an afternoon engrossed in a novel. You get so much more out of taking in so much at once. 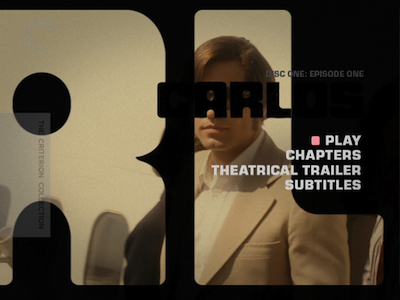 Carlos is certainly more engrossing and more informative than a generic, compact Hollywood biopic. It pays back on the investment you put into it. 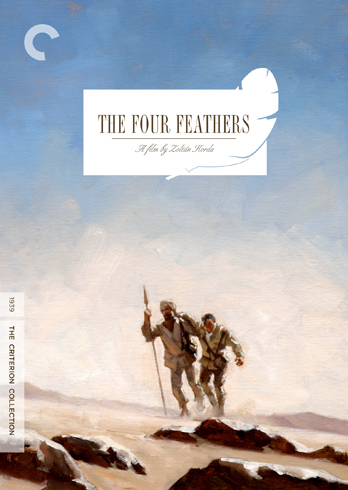 Criterion has released Carlos on DVD as a four-disc package (and separately as a Blu-ray ). The discs come in a sturdy, thick case with an interior booklet. To compare this to Che again, if you own that DVD set, the company has used a similar approach to this political epic as they did that one. The three main discs separately house each chapter of the movie, as well as bonus features that look at the film's production; the fourth disc has a trio of supplements, including two lengthy documentaries that look at the real-life Carlos. 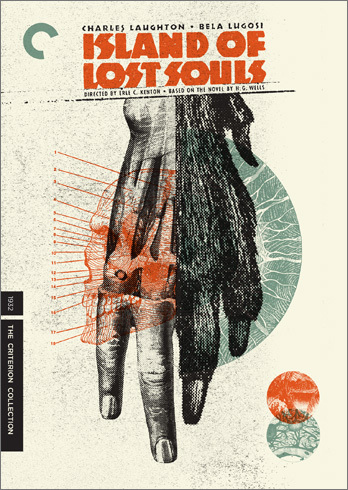 These are fascinating as they reinforce Assayas' attention to detail and give some further perspective to how interesting his dramatic approach was. 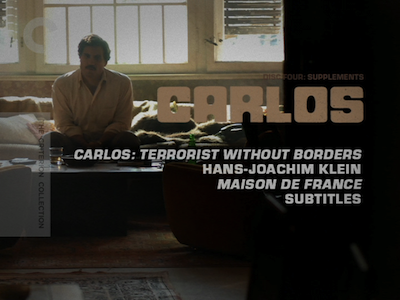 The hour-long Carlos: Terrorist Without Borders was made for French television (presumably in the 1990s) and covers the early life and career of Ilich Ramirez Sanchez, the man known as "Carlos." We peek in on his childhood and his early activist beginnings, and the archivists uncover rare photos and footage of the terrorist. Investigators and journalists give insight into the history, while associates like Hans-Joachim Klein sit for new interviews and give first-hand accounts. The other feature-length documentary, Mason de France (88 minutes), also gets to talk to colleagues of the Jackal, including his former lover, Madelina Kopp, and his wife at the time of filming. Kopp was actually one of the motivating factors behind the Maison de France bombing, an incident not detailed in Carlos. While she and one of their other associates were in jail in Paris, Carlos ordered various terrorist attacks around Europe in protest of their incarceration and to influence their release. This particular bombing was at a French consulate in Berlin, and one person was left dead. The focus of this film is that victim, and the filmmakers talk to his friends and family in order to put a human face on the effects of terrorism. For those who might worry that Carlos glamorizes the killer and makes him an antihero, this documentary effectively lessens the glow of the dramatic construct. Ironically, Carlos' efforts to free Kopp got her sentence doubled.